If the Apex of Humanity, the sprawling, hovering capital of the Path of Progress had to be described with one phrase, it would be „Venice of the Skies”. The city’s architects carefully preserved the Byzantine, Baroque, Gothic and Renaissance styles of the original, now submerged Venice. However, at every corner, classic architecture is entwined with state-of-the-art technology, showcasing that the Path of Progress is second to none in scientific advancement. There are no roads in the Apex – the city’s gigantic hovering platforms and buildings are connected by the Cloudways, a high-speed transport network. Sky Gondolas – the most basic form of transportation – are a common sight on the Cloudways, as are citizens with various PTDs (Personal Transportation Devices). Depending on the owner’s budget and of course the latest trends within society, PTDs come in all shapes and sizes, from cheap hoverboards to multi-person Cloud Speeders. 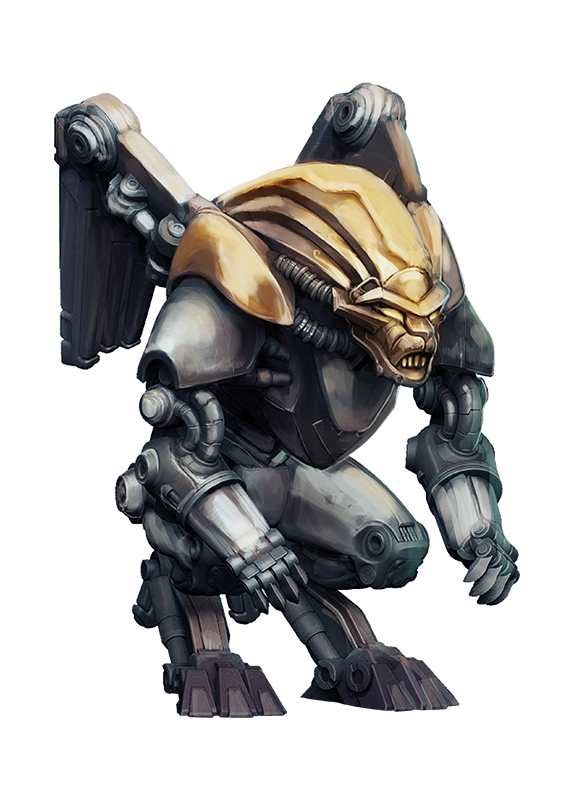 Much rarer sight are the Gargoyles, the majestic, mighty Exosuits of the Path of Progress, capable of prolonged periods of flight without Cloudway support. 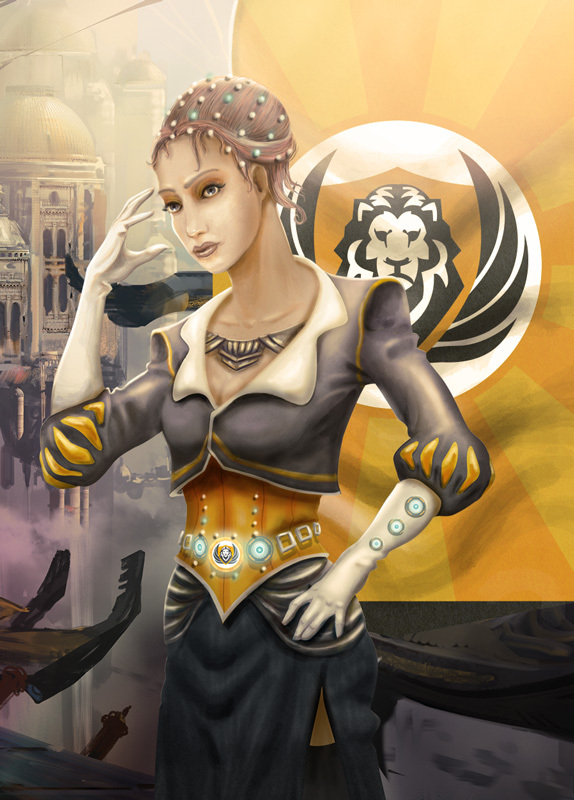 Thanks to their advanced technology, most manufacturing and agricultural processes in the Apex are fully automatized, and the majority of the citizens serve the Path as intellectuals - either in the vast city administration, or as scientists, artists and free thinkers. The Path of Progress preserved humanity’s thirst for culture: the Apex is home of a new renaissance in arts, poetry and film, with many galleries, cafés, museums and theaters to keep the population entertained. The incredible hovering platforms supporting the city were built as high in the skies as it was humanly possible. The outer layer of the troposphere was far enough from the contamination, but the scarcity of oxygen presented a new problem. The first of many impressive achievements of the Path’s engineers was a gigantic protective dome around the platforms, functioning much like a greenhouse and serving an essential part in keeping the temperature, humidity and oxygen on safe levels. Despite of all this, the Path of Progress’s technology is everything but environmentally friendly – to them, Earth is just an uninhabitable, dead world that’s beyond salvation, so they treat it accordingly. All the waste and sewage of the Apex is simply released from the platforms, so the surface underneath it is a horrible, contaminated wasteland avoided by all but the most reckless surface-dwellers. From afar, the city is a truly marvelous sight, with beautiful cascades descending from majestic floating platforms – until one realizes that the cascades are actually the city’s raw sewage. From the inside, however, the Apex looks almost unnaturally clean and organized - the Path of Progress is desperately trying to uphold the looks of a modern, civilized society. The fashion taste of the citizenry is rather sophisticated, even poorer inhabitants dress elegantly and use various perfumes. The fashion style, just like the city itself, is a seamless mix of modern and renaissance, with plenty of room for expressing individual tastes. This is particularly important, because citizens of the Apex look very much alike – all of them are tall, thin and muscular, with pale, pearly skin. It had not always been like this. In the early days, the Path of Progress had the fewest followers, and due to their vanity and pride, mixing with other Paths was hardly an option. Inbreeding was a common thing in the old times, resulting in many misshapen and handicapped offspring, which was something the Path of Progress was too vain to accept. In the beginning, cheap plastic surgery was a half-solution, until a monumental breakthrough in genetic engineering. By dabbing into the DNA chain right after inception (a now-obligatory process), a special class of doctors called Shapers were able to “hand-craft” the perfect-looking child. With this technology at their disposal, followers of the Path of Progress have developed a strong sense of superiority – they consider themselves to be the next step in human evolution, and while they are careful to always act polite and tolerant in their diplomatic endeavors, in reality they deeply despise the other, “lesser” Paths. Consequently, reproduction with followers of the other Paths is strictly forbidden – such an act means immediate expulsion from the Path and the Apex. Sexuality is far from being a taboo topic within the Apex’s society. Brothels are a common sight in the city, catering to all sorts of sexual tastes, for both men and women. Courtesans are respected members of the society, and visiting them is widely accepted, even in relationships. The Path of Progress has a very strong sense of fellowship. In an alternative economic model, Credits are distributed to each citizen regularly and individually, based on his or her contribution to the Path’s progress in the fields of technology, culture and growth. These individual performances, as well as the amount of Credits awarded, are judged by the Patrons’ Court, the political elite of the Path of Progress’ society. At the age of 14, each citizen gets a Patron assigned to him or her during a ceremony called the Exaltation – this Patron will be guiding and judging the protégée through his or her entire life. Only the most notable citizens with the purest lineage can become Patrons. During their initiation, Patrons receive a special, mysterious genetic treatment developed by the Shapers that prolong their life to 2-3 times of that the average Apex citizen. In the center of the Apex stands the Library - the city’s most notable building, a cornerstone of the Path of Progress. It is a special, state-of-the-art knowledge center, where citizens can study using a groundbreaking meditational technology. With the help of a special substance and machinery, they enter a state of heightened awareness, where they are able to absorb knowledge at an incredible pace. On top of theoretic knowledge, this method is just as useful for simulating practical applications. The study programs are created and maintained by the Librarians, who use them to slowly shape society’s way of thinking. Their influence is subtle, but rivals that of even the Patrons’. Gargoyle pilots appointed by the Patrons are also trained in the Library with a special program. This training can be finished by practically anyone in days, but since Gargoyle pilots are in frequent contact with the outside world, they are under specific surveillance by the Patrons. It’s also a dangerous assignment, and few citizens are willing to give up the comfort of Apex to become Gargoyle pilots. 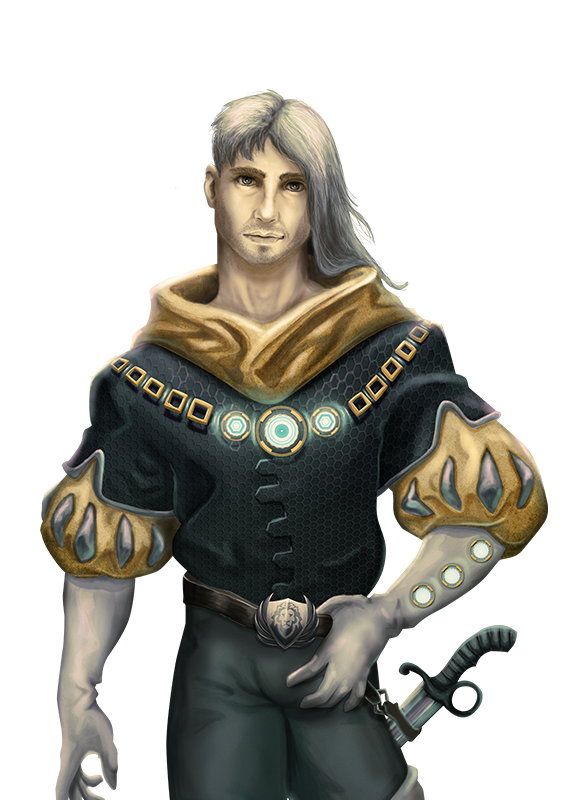 Knowledge and learning is a basic human right of all citizens of the Apex, and they are free to choose their area of specialization as long as it serves the purpose of the Path – but in reality, these choices are very strongly influenced by the Patrons and the Librarians. As a child, Cornella had always been treated by her parents as she was special - better than the others. At first, this seemed to have a very good influence on the little girl’s personality, but the older she got, the more of a burden it eventually became. As she desperately tried to fit to the picture her parents had painted of her, she slowly became obsessed with acquiring knowledge – it was the only thing that made her feel satisfied. She spent all her time studying, researching and experimenting, just to live up to the expactations she had for herself. As she never really cared about social life or the pleasures Apex had to offer, she slowly lost the ability to bond with others. However, this was not something she felt to be a problem, as for her, relationships were only a waste of time. She only respected those who worshipped science and knowledge like herself, especially those who she found more intelligent than her, as she desperately wanted to overcome them. When she was taken under her Patron’s wings, Cornella decided to become a member of the Patron’s Court herself. She knew she had the intellect needed to fit the role, but she had to make her way through the right people. She expanded her knowledge in psychology, sociology and human behavior. She understood how feelings work through science, and how to influence anybody by affecting their emotions. Her plan was to approach people of importance in a scientific way, earning their trust through giving them what they want, even if it involves faking romantic feelings. Each well-calculated step of hers eventually led to her securing a place in the Patron’s Court. Once she had the most influential people in her hand, she was appointed Chief Executive Librarian at the Library of Apex. With this, she finally achieved her ultimate goal: obtaining unlimited access to all the knowledge in the Path of Progress’ possession. Today, she’s leading all the major projects in research and development, and she is both feared and admired for her stone-cold ambition. 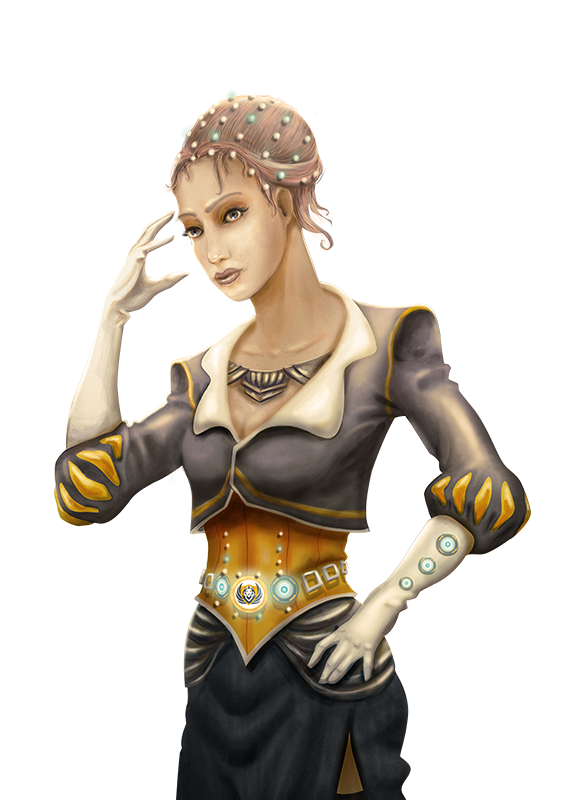 She works closely with Patron Valerian, especially on the technological projects, involving the improvements of the Gargoyle type Exosuit Models. Valerian became an orphan at a very young age. He never knew his father, and was raised by his mother, who worked as a Librarian and died in a PTD crash caused by a malfunction in her vessel. Before they had the chance to take him to an orphanage, he escaped the authorities and chose to live in the common areas of the Apex, and the endless system of the Cloudways. He made a promise to her mother’s memory that one day he would become someone she could be proud of. With nothing better to do, he spent his days either acquiring as much knowledge as he could in the Library (where he basically grew up, since her mother spent most of her time working) or running from the authorities. This made him memorize the whole transporting system and the setting of Apex, and he developed an athletic physique and a very quick and practical way of thinking. His ambition to rise to the top of the society rarely let him sleep. By night, he developed a habit of sneaking into the Library’s Gargoyle simulation section and hacking into the system. By the time he reached 20, he was one of the best pilots in Apex with an outstanding knowledge of how the Gargoyles work. He used this expertise to develop a special micro-drone that could attach itself to unmanned Gargoyles, and allowed Valerian to remote-control them. This quickly made him a wanted man in the Apex. He was always careful, never leaving a trace behind, but one day he made a mistake and that changed his life forever. As he was testing his new version of the remote piloting technology, he didn’t notice that the Gargoyle he was targeting is just about to be powered up – by none else than Patron Lazaro, whose hobby of Gargoyle piloting was well known. 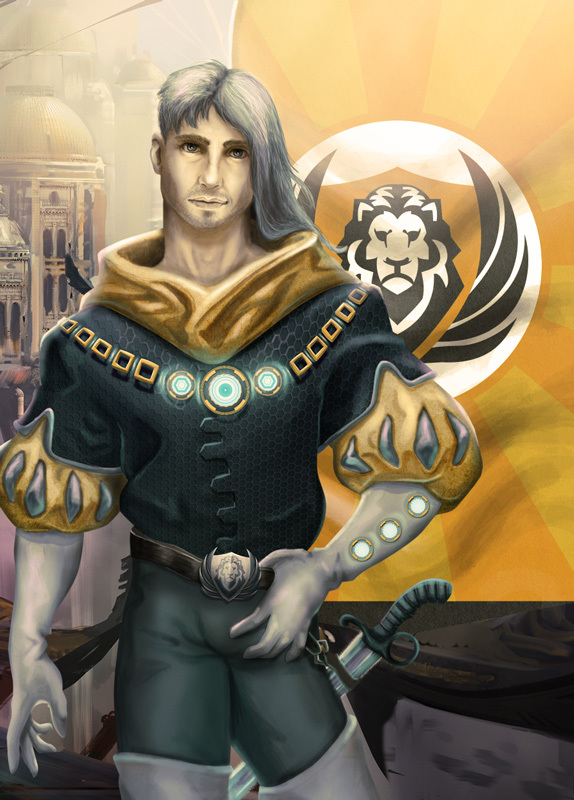 Lazaro managed to override and trace back Valerian’s infiltration attempt, but instead of having him taken into custody, he saw the great potential in the cunning and ambitious young boy, and took him under his patronage. Under Lazaro’s guidance, Valerian was trained in the classical programs of the Patrons, and by the age of 40, he became a Patron himself. With the whole array of classical Patron teachings coupled with his cunning and street wisdom, he was the forerunner of a new generation in the Apex’s aristocracy. In politics, he was a lot more open towards the Capital and the other Paths than his predecessors, and with a sense of righteousness, he was also more concerned with the Apex’s social inequalities. That said, he still fully believes in the superiority of the Path of Progress – and nothing proves this better than the army of remote-controlled Gargoyles under his command.